A 1922 Bolshevik propaganda poster: "We don't want war, but we will defend the Soviets!" The term in Finnish historiography heimosodat (German: Kriege verwandter Völker) has been translated literally into English as "Kindred Nations Wars", "Wars for kindred peoples" or "Kinship Wars," specifically Finnic kinship. It is sometimes erroneously translated as "Tribal Wars". It refers to conflicts in territories inhabited by other Baltic Finnic peoples, often in Russia or in borders of Russia. 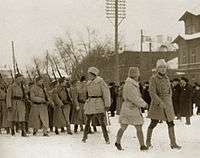 Between 1918 and 1922, some 9000 Finnish volunteers took part in these conflicts, either to assert Finnish control over the areas inhabited by related Finnic peoples or to help them to gain their independence. 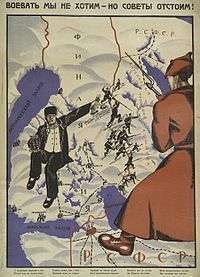 Many of the volunteer soldiers were inspired by the idea of Greater Finland. Some of the conflicts were incursions from Finland and some were local uprisings, where volunteers wanted either to help the people in their fight for independence or to annex the areas to Finland. Pohjan pojat ("Sons of the North") and I Suomalainen Vapaajoukko (I Finnish volunteer corps) helped Estonian troops. The phenomenon is closely linked to nationalism and irredentism as Finland had just won its national independence, and a part of the population felt that they had obligations to help other Finnic peoples to attain the same. Estonia, the closest and numerically largest "kindred nation", had gained its independence at the same time, but had fewer resources, fewer institutions ready to support its attained position, and more Russian troops inside its borders. Other Finnic peoples were at a less organized level of cultural, economic and political capability. The Finnish Civil War had awakened strong nationalistic feelings in Finnish citizens and other Finnic peoples, and they sought tangible ways to put these feelings into action. For the two next decades, Finns participated at a relatively high rate in nationalistic activities (e.g. Karelianism and Finnicization of the country and its institutions). This development was related to the traumatization and divisiveness of the Civil War. Many of the White sympathizers in the Civil War became radically nationalistic as a result of the war. The strenuous five-year period 1939–45 of total war—which also mostly unified the nation—drained this excess of enthusiasm. "War", in this context a low-intensity one, consisting of actions such as border skirmishes, expeditions by volunteer corps, expulsion of remnant occupational forces or attempts to foment rebellion in the local populace. "Tribe" or "clan", but in this context, also the ethnic and language kinship between Finnic peoples; "kindred peoples". Somewhat comparable to the German concept of Völkisch. People that are linguistically and/or ethnically kin to another; "suku" means "family" and "kansa" means "people" (singular). ↑ Zägel, Jörg; Reiner Steinweg (2007). Vergangenheitsdiskurse in der Ostseeregion (in German). LIT Verlag Berlin-Hamburg-Münster. ISBN 978-3-8258-0202-8.